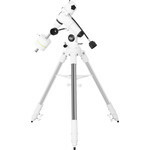 Equatorial mounts are so designed that one axis can be aligned parallel to the Earth's rotational axis. This means that the telescope only has to be rotated about this axis - called the hour axis - to compensate for the Earth’s rotation, allowing the selected astronomical object to always remain centred in the eyepiece. In order to align the hour axis parallel to the Earth's rotational axis, the direction of north and the latitude of the observing site must be known. 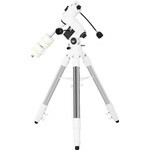 If the equatorial mount has a polar finder, then this may be used to easily align on the Pole Star.